Following demobilisation from the army in 1919, Arthur Bliss wrote four exploratory essays in sonority and textures, including 'Madam Noy' and 'Rout'. They accorded him a short-lived reputation as an enfant terrible, but they can also be said to have paved the way for his first large-scale orchestral work, the 'Colour Symphony'. The �witchery song� Madam Noy (1918) is written for soprano, flute, clarinet, bassoon, harp, viola and double bass, a bizarre variation on the old nursery rhyme �Old Mother Hubbard�. Rout is used in the old sense of popular revelry, and is a vibrant score evoking the snatches of song which might be caught by someone watching a carnival from an open window. Bliss made up a series of nonsense syllables for the soprano soloist, chosen for their phonetic effect. For the rarely encountered scena for contralto and orchestra, The Enchantress , the text was supplied by Bliss�s poet friend Henry Reed, who had suggested a setting of the �Second Idyll� of Theocritus, in which Sim�tha, rejected by her lover Delphis, uses witchcraft to entice him back into her arms. 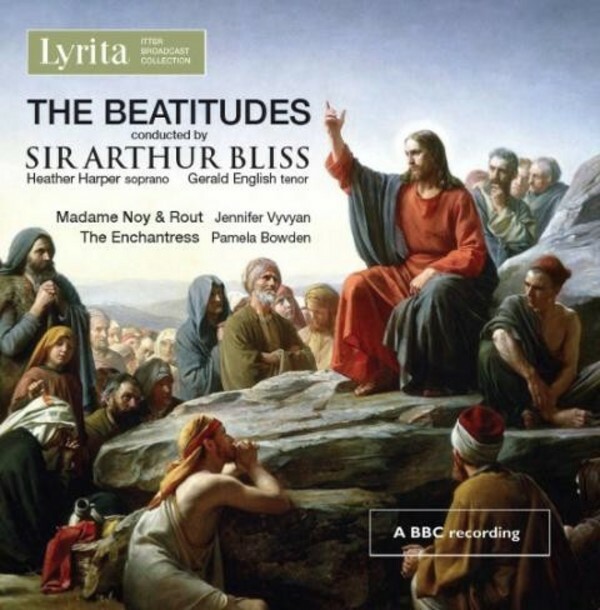 Bliss was �Master of the Queen�s Musick� when he was commissioned to write The Beatitudes for the Festival of 1962 to mark the opening of the new Coventry Cathedral. The first performance was beset by problems. Scheduling difficulties chiefly connected with the premiere of Britten�s War Requiem, meant that there was no possibility of staging The Beatitudes in the cathedral. A substitute venue was hastily arranged, and Bliss�s major choral piece made a hugely unsatisfactory debut in Coventry Theatre on the evening of 25 May 1962. In this hugely successful Proms broadcast from 31 August 1964, the lyrical passages are particularly affecting. Especial highlights are Bliss�s ecstatic treatment of Herbert�s �Easter� and the sensitivity which he brings to the directly communicative handling of �I got me flowers to strew thy way�. Also quietly impressive is the rapt realisation of Taylor�s �O Blessed Jesu� which culminates in an imposing, calmly spacious closing �Amen�. Promenade Premiere, Albert Hall, London.